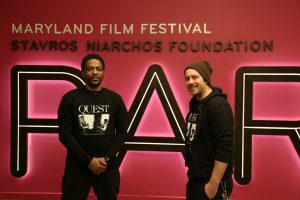 I met with director Jonathan Olshefski and the primary subject – Christopher Rainey, aka Quest – of his feature-documentary debut, Quest, on Saturday, January 13, 2018, at the Maryland Film Festival‘s Parkway Theatre (which now screens movies year-round). They were there to present the film on its opening weekend in Baltimore. We discussed the almost ten-year making of the movie (reviewed here), along with its impact on Quest and his family, and what plans both men have next. The film, itself, is a beautiful example of fly-on-the-wall, vérité cinema, and offers a powerful, poignant look at everyday heroism in the occasionally rough streets of North Philadelphia, where Quest, among many other things, runs a local hip-hop studio. Here is a condensed digest of our conversation, edited for clarity. Hammer to Nail: So, Jonathan…how did you meet Quest? 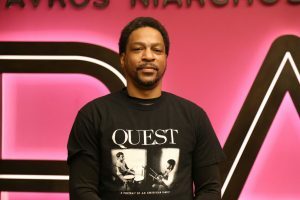 Jonathan Olshefski: So, in 2006, I was teaching a photography class to adults in North Philadelphia, and after class one day, I had a student named J.C., and he said, “You know, my brother runs a hip-hop studio out of his house, a couple blocks away. Do you want to meet him?” So I was like, “Sure! Let’s check it out!” So we walk over, J.C. knocks on the door and Quest opens it up. We had an initial kind of awkward interaction, but we exchanged business cards and I introduced myself as a photographer, and a couple weeks later, he reached out and invited me to come to the studio to take some pictures of the guys while they’re recording, and that was the initial sort of thing. I thought it was going to be a one-off photo shoot, but we just really connected, and I was really blown away by the community of the studio and the passion, just the variety of artists that they had there, over at Everquest Recordings. I was like, “Do you mind if I come back? You know, maybe we can kind of keep going, go a little bit deeper. I really want to contribute to this community.” And then, through spending time, I got to know that it wasn’t just about the studio, but that Quest was working a day job delivering papers, and he was raising his kids. It just felt like there was really something beautiful here. So, we extended the project form beyond the studio to capturing life. And then, a year and a half into it, I had this idea to maybe make a short, little documentary. So, in 2007, we started what we thought was going to be a short, little documentary, and it turned into something that took a little bit longer…and here we are. HtN: Indeed! So, Quest…two things: your given name is Christopher Rainey, so whence the name Quest; and what were your reservations, if any, about being a part of this film (or did you embrace the project right away)? Quest: Well, I’ll talk about the name, first, which is pretty simple. My studio is called Everquest Recordings, and over time, the fellas used to call me Everquest when they saw me on the street. And, you know, it just got shortened to Quest, after a while. And as for my wife, both our names are Chris. And the guys got kind of tired of calling us Chris, so they made up names for us. She’s Ma Quest, and I’m Quest. HtN: And how did that come about? HtN: (laughs) OK, then how about the project? Did you embrace it? Or did you have any reservations? Q: Oh, no! It was just like he said. It started out as a small project, with him helping me out with the guys in the studio, and in return, he needed help with a final class project. So I helped him out with that. But we had no idea, either of us, that this was going to turn into something big. And neither did my family, that’s for sure. My daughter PJ, she’ll tell you in a minute, “I was pretty cool with the camera,” but then, as she got older, it started getting on her nerves, because she never thought it would be so big. But…here we are. HtN: So, Jon – you shot this for almost a decade. How did the film evolve over the years? How did the film change and how, if at all, did the amount of time you spent on the film allow you to tell a story that you couldn’t have told any other way? JO: That’s a great question. So, the photo project started off being about the studio. But very early on, as I got to know the rest of the family, I could just tell that there was really something special here. And so, the way in was the studio, and sort of like the day jobs, but once I got to know the family, I felt like there was this really powerful story here, in just the quiet routines of a family from North Philadelphia, taking care of each other. And so, the vision, from the very beginning, was to tell this quiet portrait of a family, in a neighborhood where typically what gets told are these scary, depressing things when something happens that goes up on the evening news. I wanted to create a counterpoint to that, because those stereotypical, sensationalized stories reinforce distance. Viewers from other neighborhoods see them and say, “Oh, I’m not going to North Philly. Something bad is going to happen to me there.” I’d experienced so much beauty in that place, and I just wanted to reflect that beauty. And that’s something that was consistent throughout all the years, but I think what changed was that our friendship got deeper and deeper. We were sort of curious about each other, we respected each other as artists – he a musician, me a visual artist – and felt like we could sort of riff off each other. As the years went on, that trust built. And for 5 years, it was just kind of quiet, everyday moments: breakfast, taking the kids to school, hanging out in the studio, and, you know, some bigger moments, but overall just some quiet material. HtN: And let me just ask, was there anybody other than you, or was it really just a one-person film crew? JO: For the most part. In the early, there were one or two times that I brought someone to help with sound, or play around with lights, or whatever, but as the project developed, and I was spending more and more time, it was just me. Because, you know, we didn’t know. It was just hanging out, on like a regular day. So, yeah, I was doing camera, and sound. And then, 5 years into it, some pretty intense things happened, with the family, and they kind of brought me into that, because they felt like there was something powerful in these moments. They thought that maybe, by telling this story, they could help somebody else. And so, the family brought me in, and at that point, it was the trust that we had, and the shared vision of telling a complex, honest, authentic story of a North Philly family, hoping that maybe it could be good for somebody else to share that. HtN: Sure. The time together had brought trust, and in a moment like that – no plot spoilers – because trust had been built up over the years…that’s a great example of how filming for 10 years allowed you to tell that particular moment. JO: Oh, absolutely. And part of it, too, is that the trust was built by me spending time there, but I live in Philadelphia, so it was a two-way street. It wasn’t just me, coming in with a camera, and having it be this one-way relationship. The Rainey’s became a part of my life, as well, and got to know my family, my wife, my kids. They were at my wedding. They know my kids. And so, that also was part of it, having this two-way street, and having the relationship be not just about making the movie, but about the friendship. And that led to a lot of different things, and a lot of different experiences outside of making the film, that kind of built that trust over the years, as well. HtN: Sure. So, Quest, were there times when you, or Christine’a – Ma Quest – really didn’t want the camera around, but allowed it anyway, for the sake of the film? You already mentioned you were all in, but were there any moments of discomfort, where you perhaps thought twice about bringing Jonathan in with his camera? Q: There was never a moment where I ever actually thought twice. Now, there were moments where I wished that I got up before he did, because he would go with me on my job, sometimes, at 3 o’clock in the morning. He would spend the night, and we would leave to go on my paper route. As soon as I would get up out of bed, he’s right there with the camera. Two seconds, and I’m like, “Oh! Wait a minute, Jon! Let me put some clothes on,” or whatever, because he really captured some intimate moments. And I think it was kind of special when you go look back at it, because watching my family grow over the years, and watching everybody mature, is such a beautiful thing. And as the time goes on, with the camera being in the room, you kind of forget about it, because Jon became part of the family, so the camera kind of disappeared after a while. It wasn’t really hard at all for us to deal with the camera, because it was just a one-man show, so to speak. One friend, with his toys, you could say. It was easy for us to forget the camera was there. HtN: Jonathan, you started this while a student at Temple, right? You were still a grad student? JO: So, it’s a complicated story. What happened was that the photo project started before I went to grad school. I was actually working construction, and doing art on the side, and then starting to get interested in maybe transitioning from photography to making documentary films, and so I ended up enrolling in the MFA program at Temple University. And my first cinematography project was like, “Hey, here’s the really amazing family that I’ve been working with for a year and a half. Let’s make that be my first little short project.” And then, obviously…(chuckles)…it extended well beyond that. JO: Yeah, I teach at Rowan University now, and my biography over these last 10 years is: working construction; doing art on the side; living in a house with a bunch of people, sleeping in a bunk bed in a hallway; starting grad school; and then really early, getting married and having a kid, within a year of grad school. And so again, my life really shifted and changed over all these years, and it was really cool to do that with the Rainey’s and to be able to look to them. But then, 2 years later, I’m a dad. And I’ve got a wife. I can’t just sleep in a bunk bed in a hallway and live dirt cheap anymore. And so again, looking back at Quest, I’m like, “Oh, this dude is also juggling a ton of responsibilities, to his kids, and even grandkids, and also paying the bills, and keeping the studio alive, and also taking care of all these artists.” So, that really blew me away, especially as I started getting my first taste of real responsibility. HtN: Right. Has your perspective, on the filmmaking process, and the film itself, evolved since you’ve been faculty. I’m a faculty member at a university, myself, and I’m just curious if, through this trajectory, your view of the process changed. Did you bring your film into class, to use as an example? JO: Oh, yeah! I see that! Even being a grad student and being among my cohort of other grad students, we mutually inspire each other. And the same thing, you know, faculty member to student. I’m inspired by my students, and I’m excited by their work, and I share my story, too. I’ve been teaching at Rowan since 2011, and for a number of years, I’ve been like, “I’ve been working on this project for a while, and it’s never gotten done. It’s all about perseverance and struggle. That’s part of the game! You want to get into the media-arts world? You have to be prepared for that.” So, I’ve found that to be very empowering to be able to share my journey and sort of just dialogue with students. HtN: Quest, I’m curious: now that the film is done, have there been any changes in the lives of anyone? I’m thinking, in particular, of your daughter, again without giving away any plot spoilers. How is she doing since the major events that we witness in the film? And also, I’m curious about Price [a hip-hop artist profiled in the movie]. HtN: Not a teenager anymore! Q: Not a teenager now. I have to bargain with her, vs. me telling her what to do. So that kind of changes things for us, a little bit. It’s odd having adult conversations with her now, because it’s like an argument, and I can’t send her to her room anymore. We have to finish our argument…(laughs)…come to some sort of agreement. Q: William is also doing excellent. He’s taking care of his son. My grandson Isaiah just turned 5 this year. And he’s doing really well, too. So, not to give away the plot, but everybody is OK.
HtN: Good, good! I’m glad to hear that. One of the things I love about the movie is its specificity of detail and open-endedness. Because life goes on, but in its own unique way. I’m just curious if you guys have any thoughts of a sequel, down the road. You know, just a follow-up, sort of like a Michael Apted 7 Up, 14 Up, 21 Up kind of thing. HtN: That’s right! See what kind of a father he is! Q: Oh, I know he’s a great father. Like he said, we spend a lot of time together, so we kind of know each other’s children. And watching everyone grow up together is really cool, like an extended family. HtN: I love it! One final question. 10 years is a long time in the world of technology. As a filmmaker and a faculty member, I see how it changes all the time. What technical challenges, in terms of codecs and working with different cameras over the years, did you have to navigate? JO: Well, that early footage was shot on the [Panasonic] DVX100 – standard definition – amazing camera, great in low light. And then I transitioned to a variety of HD cameras, and ultimately settled on the Canon 5D, Mark II, and then Mark III, and so just kind of rolled with that one from 2010 on. But with some of that earlier footage, you know, technology has changed, but so has technology for color correction and post-houses, which has gotten better. So, they were able to match that old standard-definition stuff to the HD stuff pretty well. That problem was sort of pushed over to the finishing side, and Final Frame, in New York, did a great job of making the stuff look good. HtN: Well, thank you both. I really enjoyed the film. Congratulations on it.